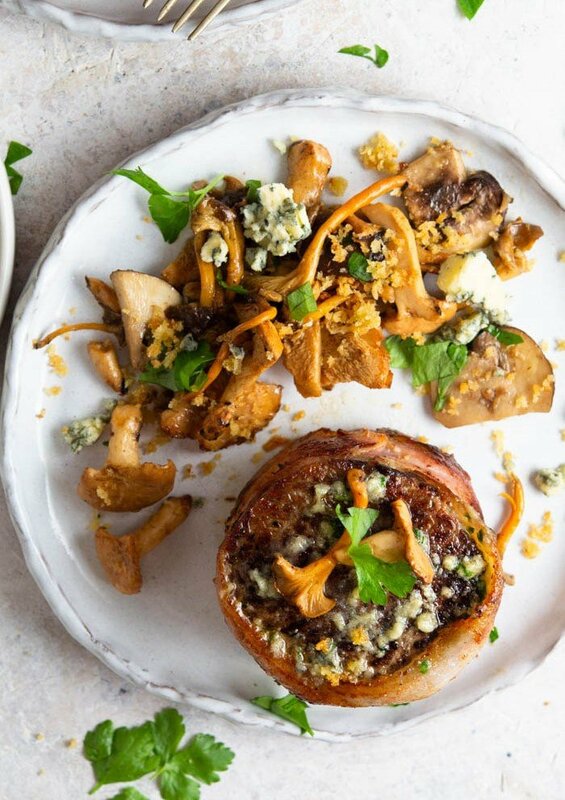 These melt in your mouth filet mignons get topped with a flavorful homemade blue cheese crunch butter, wrapped in bacon and served with seared wild mushrooms and toasted breadcrumbs. These steaks are the ultimate date-night indulgence. To get a jumpstart on this recipe, make the butter a day or two ahead, and store in the refrigerator. It’s also delicious stuffed into a hot baked potato. A filet mignon, French for tender/delicate filet, is actually a slice of the smaller end of the beef tenderloin. So while all filet mignons are cuts of beef tenderloin a beef tenderloin is not a filet mignon. How many calories are in an 8 oz filet mignon? An 8-ounce serving of filet mignon has about 493 calories, 227 of which are from fat. It contains 12 grams of saturated fat and 253mg of cholesterol. This means that filet mignon falls under the USDA classification for a lean cut of beef. Cooking your meat in butter and serving with various preparations will alter these numbers of course. If you’re looking for a healthier cut of beef you can try substituting the filet for rib eye. For the blue cheese crunch butter; in a small bowl, stir together all of the ingredients; butter, cheese, breadcrumbs and seasoning. Reserve 4 tablespoons of the mixture in a small bowl at room temperature. Spoon the remainder onto parchment paper and form it into a log shape. Wrap the butter log in parchment paper, twisting the ends in opposite directions to seal (like a candy wrapper). Refrigerate it until firm, about 30 to 40 minutes. After, slice 4 tablespoon-sized pats of butter. Keep it refrigerated. 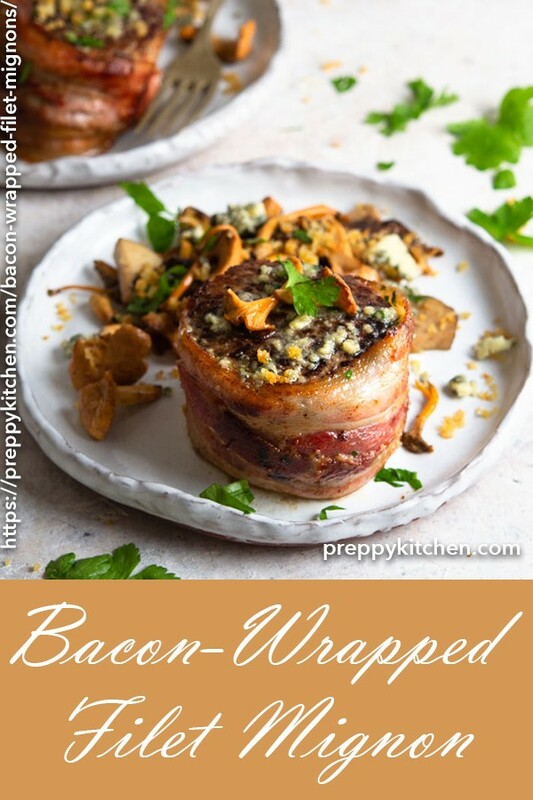 For the steaks; Preheat the oven to 400 degrees F. Spread each bacon slice with the softened blue cheese crunch butter. Let the steaks come to room temperature, pat them dry with paper towels, wrap them with the bacon (cheese side facing the steak) and secure it with a wooden pick. Sear them until a crust forms on the bottom, about 2 to 3 minutes. Using tongs, turn the steaks to brown the bacon-wrapped sides lightly. Place the steaks browned side up, top each one with a pat of blue cheese crunch butter then add mushrooms to the skillet. Toss the mushrooms to coat them in the pan drippings. Now place the skillet in the preheated oven and set a timer for 6 minutes. For the topping; melt the reserved crunch butter in a small skillet over medium heat. Add panic and stir until golden brown (2-3 minutes). Check the steaks after 6 minutes and cook for an additional 2 minutes or until desired. Let them rest 10 minutes before serving. To serve, divide the steaks and mushrooms between two plates. Sprinkle on mushrooms, toasted breadcrumbs and additional blue cheese, if desired. 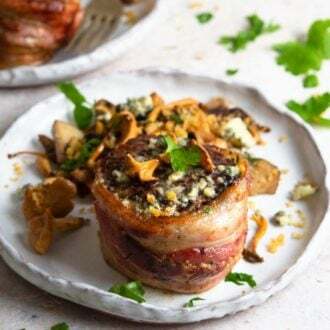 If you’ve tried this bacon wrapped filet mignons then don’t forget to rate the recipe and let me know how you got on in the comments below, I love hearing from you! 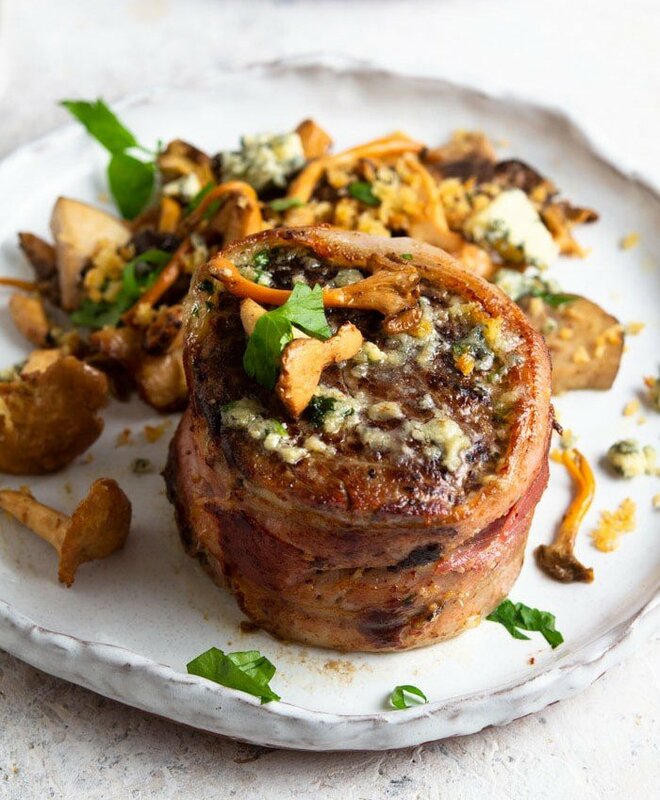 These melt in your mouth tender filet mignon pack an extra flavorful punch thanks to bacon and blue cheese. In a small bowl, stir together all ingredients for Blue Cheese Crunch Butter. Reserve 4 tablespoons mixture in a small bowl at room temperature. Spoon remainder onto parchment paper; form into a log shape. Wrap butter log in parchment, twisting ends in opposite directions to seal (like a candy wrapper). Refrigerate until firm, 30 to 45 minutes. Slice 4 tablespoon-size pats of butter; keep refrigerated. Preheat oven to 400F. Let steaks come to room temperature; pat dry with paper towels. 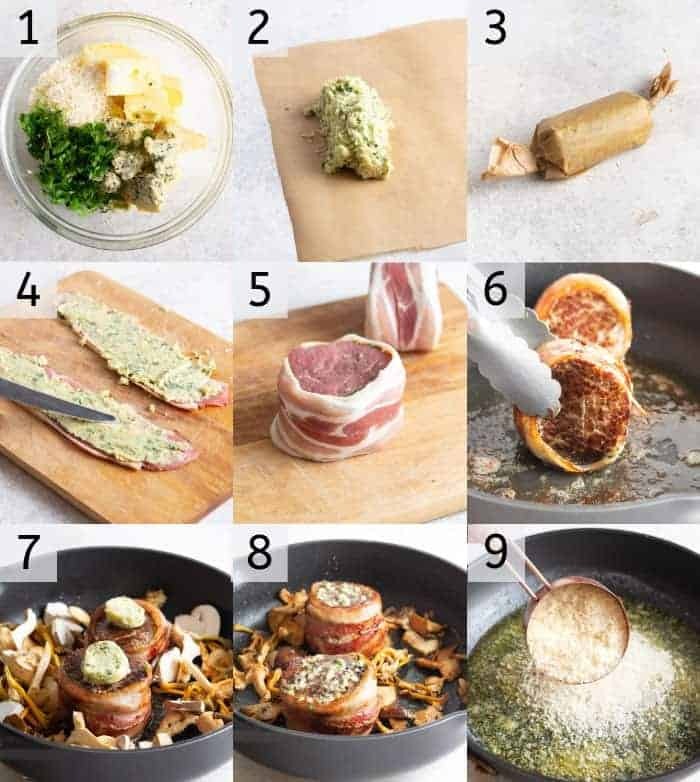 Spread each bacon slice with about 2 tablespoons softened Blue Cheese Crunch Butter; wrap steaks with bacon (cheese side facing steak) and secure with a wooden pick. Sprinkle both sides generously with salt and pepper. Heat oil in medium cast iron or stainless steel (oven safe) skillet until shimmering; add steaks. Sear until a crust forms on bottom, 2 to 3 minutes. Using tongs, turn steaks to brown the bacon-wrapped sides lightly. Place steaks browned side up; top each with a pat of Blue Cheese Crunch Butter. Add mushrooms to skillet; toss to coat in pan drippings. Place skillet in preheated oven. Set timer for 6 minutes. Meanwhile, melt 2 tablespoons Blue Cheese Crunch Butter in a small skillet over medium heat. Add panko; stir until golden brown, 2 to 3 minutes. Set aside. Check steaks for doneness after 6 minutes; cook an additional 2 minutes, or until desired degree of doneness. Let rest 10 minutes before serving. To serve, divide steaks and mushrooms between two plates. Sprinkle mushrooms with toasted breadcrumbs and additional blue cheese, if desired. Photo Note: The photo of the steaks in the small skillet was from the first round of testing. They did not include the bacon spread with blue cheese. I cooked them in a larger skillet than is shown; there was just a lot of negative space, so I transferred them to the small skillet. The second photo is from the second round. This is the perfect recipe to make my boyfriend on valentines day! I cant wait to try it. I hope it looks as pretty as yours!!! This is anniversary worthy. Our 30th is May 2 this year. I’ll keep you posted. I hope you enjoy the recipe! Let me know what you think of it.